At approximately 10:15am on Tuesday, April 17th 2012, Utah was hit with a 7.0 magnitude earthquake...sort of. Taralyn Parker participated at home with her children, ages 4, 2, and 7 months old. "I learned a lot!" Taralyn says. "I had the time wrong, so the first time I yelled earthquake and told them to come under the table with me, my two and a half year old just looked at me like I was nuts. However, when the siren went off five minutes later, we tried again and they did perfectly. We did the drop, tuck, and cover for a minute and sang our favorite songs." I love that Taralyn thought of singing songs with her kids! In an emergency situation, this is such an important detail that I think a lot of us don't think about. How are our kids going to feel? What can we do as parents to help them stay calm? Taralyn also practiced what to do after the "earthquake" was over, another detail that many of us don't think about. "Next we got out our 72 hour kits and I had the kids practice carrying those around the house. Only one rolled and the others were too heavy for the kids to carry or drag very quickly so that was a big problem. There's no way I would have gotten the baby, the kids, and the back packs out on my own and I didn't know what was in each bag. We went through what was in each bag and updated clothes, food, etc." By participating in this drill, Taralyn shared with us a few things she is going to do to help her better prepare for a real earthquake:1. Smaller rolling backpacks for the children that aren't too heavy.2. Put together a briefcase with important documents that I can grab quickly3. Practice monthly what to do with the children 4. Declutter our house - seriously! It took too long to find some of the things we needed. Annie Gines was driving in Stansbury Park at the time of the "earthquake", and thoughts of "Should I pull over? Should I keep driving?" were on her mind, and what should she do if it were a real earthquake? According to Open Hazards, if you are driving pull over to the side of the road, stop, and set the parking brake. Avoid overpasses, bridges, power lines, signs and other hazards. Stay inside the vehicle until the shaking is over. If a power line falls on the car, stay inside until a trained person removes the wire. 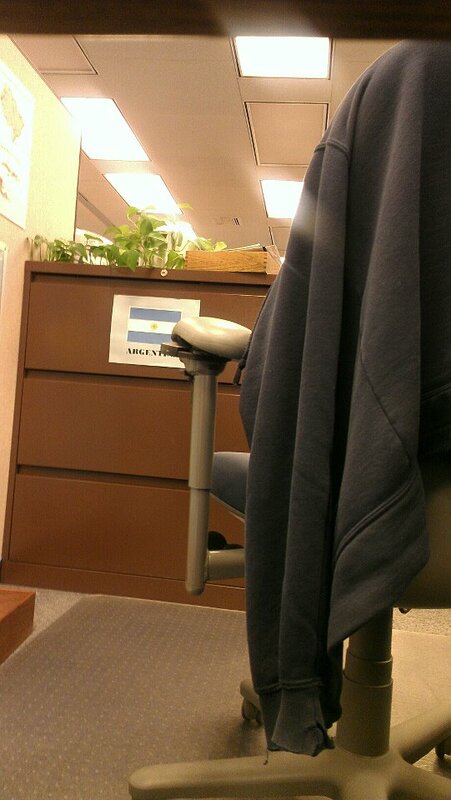 The view from my "safe spot"
Jan Zumwalt experienced the drill while at work. Her employer had sections with Red Cross papers telling them beforehand what they needed to have to be prepared at home or at work. When the "earthquake" hit, those that could get under their desks ducked and covered, while others covered their heads with their arms and a jacket. Vicki Johnson of Orem experienced the "earthquake" while shopping at Walmart. "They came on the intercom and explained what was happening,"Vicki says. "They told everyone to find a safe place to drop and cover. Most customers and employees did not do anything but I thought it was a fun drill. I saw a few people grab things and cover their heads. Then Walmart made the announcement that the ground was shaking, and ended that the quake had passed but to be aware that after-shocks are expected. Not many even acted like they heard the announcements." By practicing in drills like this one, the better prepared we can be for "the big one" when it finally does hit. Carousel Preschool in West Valley City participated in the drill with their morning class. "We decided to participate in the shakeout first of all to help the kids understand what an earthquake is. Many of the kids didn't even know what an earthquake was," says Katie Miller, teacher at Carousel Preschool. "We talked to them about how to stay safe if you're at school, and what to do. We also talked about ways they can stay safe at home. ""An earthquake means the ground shakes. We moved our chairs and went under the tables. Then we went outside," said a five year old Carousel Preschool student about the drill. Other local schools participated in the drill, instructing the students to get under their desks, cover their heads, and wait there for further instructions. Read more from ABC4 about the State Capitol, hospitals and other emergency teams that participated in the drill. 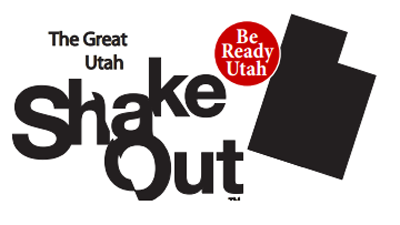 Because much of Utah lies on major fault lines, we are expected to be struck with a major earthquake at any given time. In fact, studies show that we are overdue for "the big one", and the more prepared we are, the better the chances are that we will survive when it does hit. Stay Tuned to Enjoy Utah! over the next few weeks as we prepare you for "the big one" and give you tips and tricks to help you get prepared.